The ABC Design Team has a fun challenge for you today....make a Halloween or Fall card in 30 minutes or less! I made my card based on one I received @ convention this past summer. Every idea I had would've taken a lot longer than 30 minutes so when I came across Teresa Clark's swap....I jumped at the chance to recreate her card my style---adding layers & ribbon. I can't wait to see what you come up with! The entries from last week were AMAZING & it was really hard to choose our winners!!!! Please stop by our blog to see what the rest of the Design Team made & read up on the rules to play along with us! Have fun & happy stamping!!!!! This is so cute and such a fun card! I love that sentiment and the polka dots. Cool embossing folder too. I love this! That show is super cute, but I love the large and small polka dots! love the embossing,love the colors. fabulous card! how the heck r ya? sure hope all is well. This is just as cute as can be... super adorable! What a fun Halloween card! It is adorable. Super cute card, Jackie! Love how you embossed that background w/ the circles! This is such a bright fun card! Your DP is perfect and I just love all your colors! Cute card! I love all of the dots!!! You rocked the challenge in the most cute way! Great challenge!!!. I love that embossed paper!!!. Great stamp as well... FUN!!! Jackie, this card is just way too much fun! Love it!!! So bright and cheerful! 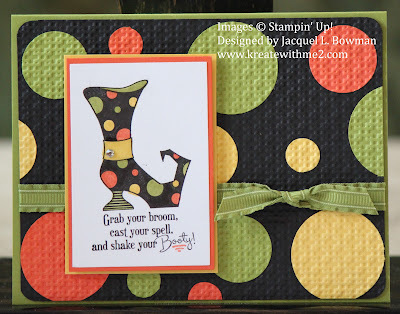 Love that polka dot boot and the colors are just the coolest! Great colors! I might have to case that! Jackie what a fantastic background you created. At first I thought it was background paper until I read your supply list. Love how it looks combined with the wonderful image. Jackie, this is fabulous! I love the wonderful colors against the black and your image is perfect!! Hi Jackie! Great saying on this cute card!